Ownership / Access: Historic House. Open to public. Notes: Grimsthorpe Castle is a country house in Lincolnshire, England 4 miles (6.4 km) north-west of Bourne on the A151. It lies within a 3,000 acre (12 km) park of rolling pastures, lakes, and woodland landscaped by Capability Brown. While Grimsthorpe is not a castle in the strict sense of the word, its character is massive and martial the towers and outlying pavilions recalling the bastions of a great fortress in classical dress. 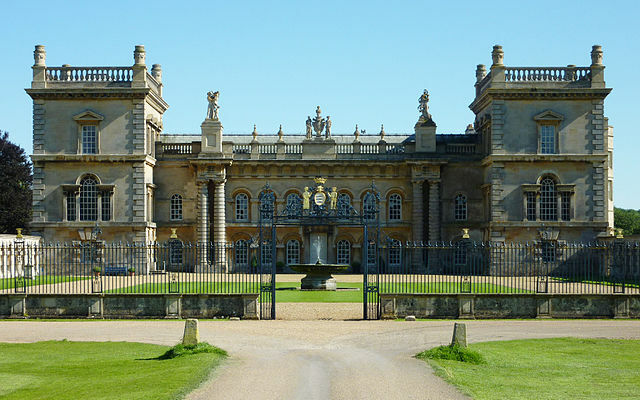 Grimsthorpe has been the home of the de Eresby family since 1516. The present owner is Jane Heathcote Drummond Willoughby, 28th Baroness Willoughby de Eresby, granddaughter of Nancy Astor, who died at Grimsthorpe in 1964.During the First World War Grimsthorpe Park was used by the Royal Flying Corps and Royal Air Force as an emergency landing ground. During the Second World War the central part of the park, near the Vaudey Abbey site, was used a bombing range. In 1944 the castle housed a company of the Parachute Regiment while it was recovering from operations in Italy and training for what became Operation Market Garden. Their flight for Arnhem began from RAF Folkingham. Grimsthorpe and Drummond castles are now owned and managed by a trust.